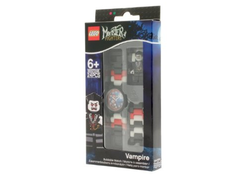 5001375 Vampire Minifigure Link Watch is a Monster Fighters LEGO Time watch. This is a description taken from LEGO.com. Please do not modify it. (see an archive of the product's page) Sink your teeth into time-telling! Build and customize your own easy-to-read watch featuring Lord Vampyre to begin even the most monstrous morning! Start with the illustrated face, then add red, black and white links to build the watchband in any pattern you like. 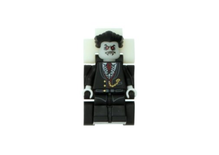 Includes an illustrated image of a ghoulish Lord Vampyre minifigure on the face. Build the watch, then build the minifigure! Makes a great gift for LEGO® Monster Fighters fans! It is produced by ClicTime who refer to it as 9007248. Facts about "5001375 Vampire Minifigure Link Watch"
Sink your teeth into time-telling! This page was last edited on 12 January 2016, at 20:49.